We got the idea to be Skittles for Halloween after someone found a picture on the internet of a girl dressed as a green Skittle. 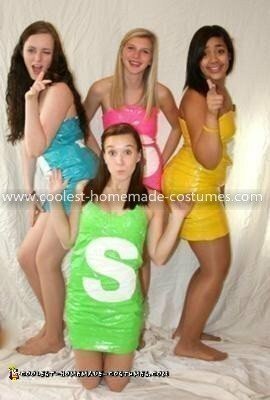 We decided we wanted to be different color Skittles, but make our dresses out of DUCT TAPE. Can you please tell me how you made these dresses. I’m on a tight budget this year and these are sooo cute. I would love to make one. Find a cheap dress you like and cover in duct tape! Are you able to pre-make the dress? since its ducktape or do you have to make it before the event that your wearing it? My friends and I went as different color Crayola crayons last year and we pre-made our duct tape dresses. We used trash bags as bases, covered the trash bags in duct tape, cut the dress vertically on one side and used adhesive velcro so we could take the dresses on and off. They worked perfectly! This is adorable and so colorful! can you please tell me how to make the dresses because me and my friend wanted to know how cause thats what were gonna be this year for halloween, and where do we get the stuff? how did you make them me and my friend just wanted to know i hope you can respond soon ok thanx bye! Just find a dress that you will never wear again, and add a zipper to the back or to the side (very important), next buy tons of duct tape depending on your size (sometimes there are sheets of duct tape as well which were used on the green and pink dresses.) Remember to spread your legs out a bit, the dresses get extremely tight! We had the S’s made by a graphic designer because it was difficult to make the S’s out of duct tape. You can also do this with M&M’s. Have fun! !